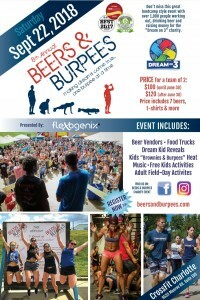 Check out what Beers & Burpees is giving away and don’t forget to sign up if you haven’t already!! 1 randomly selected person who registers for their Sept 22 Charity Event between 7/23 and 7/27 will win Two VIP Box Seats to the Macklemore & Kesha concert on Aug 1 in Charlotte including VIP Club Access and VIP Parking! B&B is a boot camp style workout, partner event with optional beer mixed in with Regular, Competitive, Kids, Adaptive and Kids Adaptive divisions. Event donates 100% of the money back to Charlotte special needs kids to make their sports dreams come true via the Dream on 3 charity and their goal is to donate $100,000 this year.